The best iOS recovery tool to recover deleted or lost messages, contacts, photos, videos, notes, call history and more from iPhone, iPad and iPod Touch. If you want to recover deleted Instagram messages on iPhone, you can take a look at the 3 Instagram message recovery iPhone ways for how to recover Instagram message from iPhone. If you want to know how to recover deleted Instagram photos and videos on the iPhone, try the following 3 Instagram photo recovery iPhone ways. Free download the iPhone data recovery software to recover deleted Instagram photos from iPhone. If your iPhone DCIM folder is empty, you can try the following 5 ways for how to recover DCIM folder on iPhone easily and effectively. 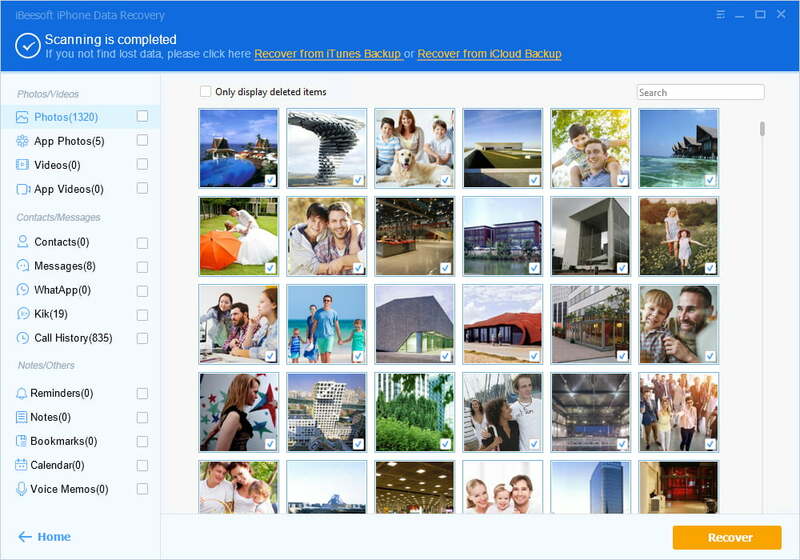 Free download the iPhone DCIM folder recovery software to get you deleted or lost photos back. Either you want to restore Line chat history on iPhone or recover deleted Line chat history on iPhone, you can try the following 5 ways. Select the right Line chat history recovery iPhone. Here are 3 ways for how to recover deleted Skype chat history on iPhone: Scan iPhone for it, extract from an iCloud backup file or iTunes backup file. You can choose the right iPhone Skype messages recovery way to recover deleted Skype messages on iPhone. 5 ways are mentioned for you to recover deleted notes on iPhone from backup files or without backup file. It depends on you to choose which way that’s right for you. Free dwonload notes recovery iphone tool to recover iPhone notes. There are 3 ways for how to recover deleted voice memos from iPhone, including how to recover deleted voice memos on iPhone with and without backup. Free download this voice memos recovery iPhone software to retrieve voice memos in iPhone 7/7 Plus/8/8 Plus/X/Xs/Xr now! If you’ve lost or deleted MOV video files from iPhone, you can recover iPhone videos by scanning your iPhone directly, extracting MOV videos from iTunes or iCloud backup. This article is a detailed guide for how to recover deleted photos from Camera 360 on iPhone, how to recover deleted photos from Camera 360 on Android phone and how to recover Camera 360 photos in computer. Check it out. iPhone voice recorder is a must for users who need to record voice. Here are the 10 best iPhone voice recorders you might be interested in. If you’re looking for screen recorders for iPhone, you need to take a glimpse of the top 10 most popular iPhone screen recorder. Awesome! News app for iPhone is a must since now you can get the latest news in real time. Here are the 10 best news app for iPhone for you to choose from. Choose the right one for yourself. This article introduces you 4 ways for how to recover deleted Safari bookmarks on iPad. Check out the guides and choose the one recover Safari bookmarks on iPad that’s right for you. How to recover safari history on iPhone or iPhone safari history recovery? Here are 4 ways helping you recover deleted Safari history on iPhone easily and effectively. Here are the top 3 ways for how to recover Line chat history from iPhone: recover Line messages from iPhone, iCloud backup and iTunes backup. "All my bookmarks are gone from Safari on iPhone" when encounter the problem, you have at least 5 ways to recover deleted favorites in Safari on iPhone. "When find snapchat messages are deleted from iPhone, you can try 4 ways to do Snapchat messages recovery on iPhone. The best ways to get them is to try iBeesoft Data Recovery. If you don’t know how to view old snapchat messages on iPhone, you can check out the following 4 ways for how to view old snapchat messages on iPhone. WhatsApp Photo Recovery: recover deleted photos from WhatsApp with a 1-2-3 simple steps. Install software, scan for deleted photos and recover them both on computer and phone. If you want to know how to export WhatsApp chat history on iPhone, you must be interested in the following 2 ways for how to export WhatsApp from iPhone. There are 4 ways for backup WhatsApp messages on iPhone: backup iPhone WhatsApp messages selectively, by iCloud, iTunes and iCloud Drive. How to get deleted WhatsApp messages on computer and iPhone? Here are the step-by-step tutorial guides you through the whole process of getting deleted WhatsApp messages. If you’re plan to recover WhatsApp messages online, you need to take a glimpse of the user guide below to find out the efficient and useful way. It’s quite easy to archive WhatsApp messages on iPhone: choose wanted chats > swipe from right to left > tap "Archive". Try by yourself now. How to get back deleted WhatsApp messages? The answer is quite simple: get back deleted WhatsApp messages by recovering them. It’s easy to restore WhatsApp chat history on iPhone. You can see there are 4 basic ways for how to restore WhatsApp messages on iPhone. Here are the step-by-step guide for how to recover deleted WhatsApp audio files from PC, Mac and iPhone. Want recover deleted or lost audio files from iPhone? Relax and follow 3 simple methods here to recover audio on iPhone with iBeesoft iPhone audio recovery software in simple clicks now. Don’t know how to extract contacts from iCloud? Here are the 2 most widely used ways for how to extract icloud contacts. How to extract all contacts, even deleted contacts from iPhone? The article lists 3 methods to export iPhone contact: from devices, from iTunes, from iClouds. Two ways to access and extract contacts from iTunes Backup. If you don’t want to cover current data on iPhone after syncing from iTunes, there is another way to extract contacts from iTunes Backup. How to transfer contacts, even lost contact from iPhone to computer without syncing to iTunes. 4 Ways to recover old iPhone photos when you delete by accident:recover from “Recent Deleted” Folder, recover from device directly; retrieve from iTunes and iClouds. Wondering how to transfer contacts to new iPhone? Don’t worry. There are 2 ways available for how to get contacts to new iPhone. Do you want to know how to merge contacts on iPhone? Actually, there are 2 ways to merge contacts on iPhone. Check the 2 simple ways right now. Every iPhone users may lost contacts due to various reasons, the article will show how to undelete contacts on iPhone quickly. If you have disabled your iPhone and want to recover photos from it, learn the ways available for how to recover photos from disabled iPhone. 4 ways are introduced to you for how to sync or export contacts from iPhone to Gmail. Select the right way to sync iPhone contacts to Gmail. This article tells 3 ways for how to recover deleted or lost WhatsApp pictures on iPhone: recover from iPhone, recover from iTunes and iCloud backup file. The best free iPhone data recovery software available online is described below. The 11 iPhone data recovery applications vary in their characteristics. However, all share one commonality, they are free. List two methods to sync contacts from Gmail to iPhone. Besides that, the article introduces how to recover lost contacts from iPhone without backup. You can save iPhone contacts either selectively or save them all. Here are the commonly used 3 ways for how to save contacts from iPhone. How to export all contacts, selected contacts, even deleted contacts from iPhone to computer or android devices? The article lists 2 ways to guide to transfer contacts from iPhone. All of available ways to restore deleted photos on iPhone are listed in the articles, users can follow the detailed procedure to complete photos recovery. This article tells you 3 ways for how to restore iPhone contacts from backup selectively or via one click. Choose the way that’s right for you. If you lost or delete your photos from iPhone without iTunes or iClouds backup unluckily, the most effective way is to select a reliable and secure recovery tool such as iBeesoft iPhone data recovery. Except downloading messages from iTunes Backup and iClouds Backup, you could download from iPhone directly with tool when you lose iPhone text, especially when you didn’t backup to iTunes or iClouds in advance. Here are the 3 ways to recover deleted photos from iPhone: recover from iPhone directly, extract photos from iTunes backup file, and extract photos from iCloud backup file. This article introduces you 3 ways to backup SMS on iPhone: via iBeesoft iPhone Data Recovery, iTunes and iCloud. This article tells you how to read deleted text messages on iPhone, from iTunes backup files an iCloud files. There is a way always works for you. This article tells you how to backup selected text messages on iPhone to PC, iCloud and iTunes library. Select the way you like. It’s so easy to export text messages from iPhone: directly scan your iPhone, select the text messages you want to export and save to computer. Accidentally lose or delete your text message from iPhone, how to undelete these important message quickly. Please read the article, it will introduce the safe and effective method to get back missing message. Why we need iPhone SMS recovery, the answer is so clear; and how to restore SMS from iPhone? The article will introduce the typical cases in which need to recover deleted iPhone SMS and lists the safe and quick recovery methods. Want to recover deleted text with iPhone App? Unluckily no iOS apps can really realize it, even the operation will overwrite the space, making the deleted message disappear forever. The safe and easy way is to use window program such as iBeesoft iPhone Message Recovery. If you want to extract text messages from iPhone, you must be interested in the 2 ways mentioned in this article for how to extract text messages. Here are the 10 best iPhone photo editors that allows you to beautify and edit your iPhone shoot photos. Check them out now. With iMessage being used widely; the need of recovering lost or deleted iMessage grows gradually. If it also happen to you unluckily, you could learn the article, it guides you how to retrieve deleted iMessages from iPhone with 3 methods. Do you know that there are several ways to recover deleted WhatsApp messages from iPhone? Check out the 7 ways below. Here are the 3 ways for you to recover deleted videos from iPhone if you do not know how to do it manually. iBeesoft Data Recovery offers 3 methods to recover deleted text from iPhone 6:directly retrieve deleted messages on iPhone 6, retrieve deleted texts from iTunes or iCoulds. If you have deleted photos from iPhone 6 intentionally, you can try to recover them from iTunes and iCloud backup files. If you want to view deleted messages on iPhone, you have 3 ways: view directly from iPhone and view from iTunes/iCloud backup files. Here are the best 3 ways for you to find deleted messages on iPhone: find on iPhone directly, extract from iTunes and iCloud backup files. Don’t know how to recover deleted text messages on iPhone without a backup? You can scan for the deleted text messages directly. 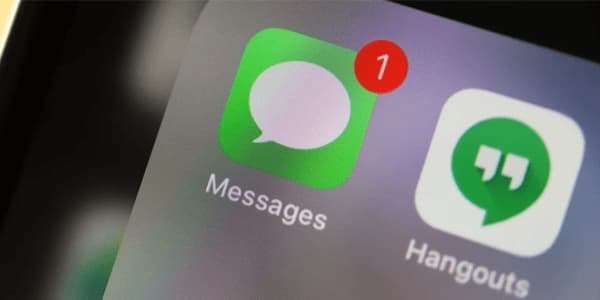 If you don’t know how to restore deleted messages on iPhone, you can check out the 4 ways to restore text messages on iPhone.